A job advertisement as Maharashtra Police Recruitment has been transmitted by Maharashtra Police. Eligible and hard working Indian Nationals can apply by submitting application form for the 1717 positions of Constable before last date which is 17th March 2017. Academic Details: Job finders should have passed 12th with good academic records from well recognized Institute / board. Contenders who want to join this organisation they should be in between 18 to 28 Years As on 31-03-2017. Salary & Pay Band: Applicants who will be selected successfully against this recruitment they will attain impressive and satisfying salary of Rs. 5200 - 20,200/- With 2000/- Grade Pay from recruiting organization. Contender will be recruited against this recruitment on the basis of their performance in Written Exam, Physical Test which is about to be conducted by the recruitment committee of organization. Candidates who want to apply for Maharashtra Police vacancy they are required to go through the official website of organization that is http://www.mahapolice.gov.in. This will open a list of the links having latest openings and candidates have to select the most appropriate link which will open the complete advertisement having further details regarding Maharashtra Police Vacancies. Online Registration Starts From : 24-02-2017. Click Here For Maharashtra Police Job Notification Link. A job notice with name as Palghar Police Department Recruitment has been broadcasted by Palghar Police Department. Ambitious, fascinated and proactive Job searchers can submit application form through online mode for the 159 unoccupied posts of Police Constable before the last date that is 17th March 2017. Qualification Required: Job searchers should have 10th / 12th or equivalent examinations from any recognized board / institute. Age of applying candidates must be between 18 to 28 Years. Monthly Remuneration: Selected aspirants for Police Constable will get the salary pay band of Rs. 5200 - 20,200/- With 2000/- Grade Pay. Selection of the candidates is based on their performance in the Written Exam, Physical Measurement Test & Personal Interview, Physical Endurance Test which is conducted by the selection panel of the Organization. Candidates who want to apply for Palghar Police Department vacancy they are required to go through the official website of organization that is http://www.palgharpolice.gov.in. Online Registration of Application Form Is Starts From : 24-02-2017. Online Registration of Application Form Ends On : 17-03-2017. Click Here For Palghar Police Department Job Notification Link. A current advertisement regarding Junior Leaders Academy Recruitment has been recently advertised by Junior Leaders Academy to inform the Enthusiastic and talented Candidates for the 38 vacant positions of Group C. Eligible Applicants can apply for Junior Leaders Academy vacancy by submitting application form till the closing date that is Within 45 Days. Qualification: Aspirants must have 10th / 12th from well recognized Board/ University/ Institute according to post. The candidate’s age should be in between 18 to 25 Years (Post 1-7,12-14), 18 to 27 Years (Post 8-11). Salary to Employees: Contenders that get shortlisted after qualifying the selection process will get Rs. 5200 - 20,200/- With 1800/1900/- Grade Pay as per organization norms. Selection of the candidates is based on their performance in the Written Exam, Skill Test which is conducted by the selection panel of the Organization. First of all appliers you have to open the official site of the organization that is http://www.davp.nic.in. This will open a list of the links having latest openings and candidates have to select the most appropriate link which will open the complete advertisement having further details regarding Junior Leaders Academy Vacancies. End Date To Submit Hard Copy of Application Form Is : Within 45 Days. End Date To Submit Hard Copy of Application Form Is (Remote areas / Flung Areas) : Within 52 Days. Click Here For Junior Leaders Academy Job Notification Link. A job advertisement for Tripura High Court Recruitment has been dispersed by Tripura High Court to inform the Desirous and brilliant Individuals for the 05 Vacancies of Assistant, Clerk. Eligible Job finders can apply for Tripura High Court vacancy by submitting their prescribed application form before the time limit that is 20th March 2017. Essential Qualification: Candidates must have completed the 8th / Graduation Degree or its equivalent with good marks from a recognized University / Institution. Aspirants belonging General / OBC Category need to submit application fee of Rs. 300/- (Post 1-3), 150/- (Post 4). Applicants who belong to the category of SC/ST/PWD & who are willing to apply they have to submit application processing fee of Rs. 150/- (Post 1-3), 75/- (Post 4). Contenders who want to join this organization they should be in between 18 to 40 Years. Emoluments: Those contenders who will fulfill the required eligibility criteria for Tripura High Court Vacancies will get a monthly consolidated of Rs. 10,230 - 34,800/- With 4600/- Grade Pay (Post 1), Rs. 5700 - 24,000/- With 2200/- Grade Pay (Post 3,4) as per the rules of the organization. Contenders will be hired against this recruitment on the basis of their performance in Written Exam, Interview, Driving Test that will be conducted by selection committee of recruiting organization. First of all, aspirants have to visit the web portal of organization that is http://thc.nic.in. Last Date to Submit Hard Copy of Application Form Is : 20-03-2017. Click Here For Tripura High Court Job Notification Link. A job notice as Tripura High Court Recruitment has been strewed by Tripura High Court to inform the Achievement oriented and skilled Participants for the 03 positions of Library Assistant. Eligible Contenders can apply for Tripura High Court vacancy by submitting their applications through offline mode before the end date which is 28th February 2017. Required Education: Those job hunters have done the Diploma (Library Science) / Bachelor Degree from a recognized University or Institution may apply. Salary Details: Selected aspirants for Library Assistant will get the salary pay band of Rs. 5700 - 24,000/- With 2800/- Grade Pay. First of all, aspirants have to visit the web portal of organization that is http://www.thc.nic.in. Once the application form filled successfully Participants should Send the application completed in all respects to the address mentioned below till the closing date. Online Registration Starts From : 04-02-2017. Last date to submit application form : 28-02-2017. Bihar State Tourism Development Corporation has advertised A newest career related advertisement with name as BSTDC Recruitment to inform the Result oriented and skillful Indian Citizens for the 20 vacant posts of Clerk, Steno-typist, Engineer. Eligible Job appliers can apply for BSTDC vacancy by submitting their prescribed application form before the end date which is 17th March 2017. Academic Details: Those job hunters have done the Graduation Degree / Post Graduation Degree from a recognized University or Institution may apply. The candidate’s age should not exceed 45 Years. Pay Scale: Those applicants who will be recruited successfully against BSTDC they will attain salary of Rs. 45,000 - 50,000/- (Post 1), Rs. 40,000 - 50,000/- (Post 2-5,7,8), Rs. 50,000 - 65,000/- (Post 6), Rs. 25,000 - 30,000/- (Post 9,10,12), Rs. 35,000 - 45,000/- (Post 11), Rs. 20,000 - 25,000/- (Post 13) from recruiting organization. First and foremost step you have to take is for opening the official site, which is http://www.bstdc.bih.nic.in. This will open a list of the links having latest openings and candidates have to select the most appropriate link which will open the complete advertisement having further details regarding BSTDC Vacancies. Last Date to Submit Hard Copy of Application Form Is : 17-03-2017. Click Here For BSTDC Job Notification Link. Andaman & Nicobar Administration is looking for the Qualified and talented Indian Nationals for the engagement of 12 posts of Assistant Fitter, Welder. Recently, Andaman & Nicobar Administration has revealed A current advertisement in regard to Andaman & Nicobar Administration Recruitment. To complete this recruitment process Contenders who want to apply for this job opening may attend walk-in interview on 14th March 2017 at the given venue. Education Info: Job finders should have passed 10th / ITI with good academic records from well recognized Institute / board. Age of contenders must be between 18 to 33 Years. Pay Band for Andaman & Nicobar Administration jobs: Candidates who will be recruited successfully they will get attractive and satisfying salary of Rs. 18,000/- from Andaman & Nicobar Administration. Selection of applicants for Assistant Fitter, Welder Will be based on Trade Test. Contenders the first and necessary step is to visit the official site of the organization that is http://www.andaman.gov.in. After reading complete instructions carefully contenders are required to attend walk in interview along with application form, documents and certificates to the address well sited below. Walk In Date : 14-03-2017. Click Here For Andaman & Nicobar Administration Job Notification Link. A vacancy notification regarding LNIPE Recruitment has been dissipated by Lakshmibai National Institute Of Physical Education to inform the Result oriented and skillful Participants for the 49 Vacancies of Professor, Assistant Professor, Clerk. Eligible Aspirants can apply for LNIPE vacancy by submitting their applications through offline mode before the last date that is 31st March 2017. Required Education: Those job hunters have done the 10th / 12th / ITI / Diploma / Graduation Degree / Post Graduation Degree from a recognized University or Institution may apply. Applying candidates should not be exceeding than 30 Years (Post 8), 27 Years (Post 9-14). What amount I’ll get as pay band? : Appointed aspirants for Professor, Assistant Professor, Clerk posts will get remunerations of Rs. 37,400 - 67,000/- With 10,000/9000/- Grade Pay (Post 1-4), Rs. 15,600 - 39,100/- With 6000/5400/7600/- Grade Pay (Post 5-7), Rs. 9300 - 34,800/- With 4200/- (Post 8), Rs. 5200 - 20,200/- With 2400/1900/1800/- Grade Pay (Post 9-14) which is offered by Lakshmibai National Institute Of Physical Education. Firstly, approach on web portal of LNIPE that is http://www.lnipe.nic.in. Closing Date for Forwarding Filled Application Forms : 31-03-2017. Click Here For LNIPE Job Notification Link. Click Here To Application Form For Registrar. A vacancy advertisement regarding Thane Police Recruitment has been strewed by Thane Police. Result oriented and skillful Jobs Hunter may submit their prescribed application form for the 273 posts of Constable before the time limit that is 17th March 2017. Required Qualification: Job searchers should have 12th or equivalent examinations from any recognized board / institute. Aspirants belonging Unreserved Category need to submit application fee of Rs. 350/-. Applicants who belong to the category of Ex-Servicemen are willing to apply they have to submit application processing fee of Rs. 50/-. Contenders who want to join this organization they should be in between 18 to 28 Years As On 31-03-2017. Salary Details: Candidates who will be recruited successfully they will get attractive and satisfying salary of Rs. 5200 - 20,200/- With 2000/- Grade Pay from Thane Police. Selection of candidates that will well fitted in the working & responsibilities of the above said post will be depend on their performance at the time of Written Exam & Physical Test. Visitors have to visit the Official Website to apply for Thane Police and that is http://www.thanepolice.org. Commencement of Online Application Form Is : 24-02-2017. Click Here For Thane Police Job Notification Link. A vacancy advertisement titled as District Court Ferozepur Recruitment has been liberated by District Court Ferozepur to inform the Qualified and talented Contenders for the 12 vacant posts of Peon, Mali, Chowkidar. Eligible Individuals can apply for District Court Ferozepur vacancy by filling offline application form till the last date that is 6th March 2017. Eligibility Criteria: Aspirants must have 8th / 10th from well recognized Board/ University/ Institute according to post. The candidate’s age should be in between 18 to 37 Years As On 01-01-2017. Emoluments: After appointment of the appliers, the organization will pay to them Rs. 4900 - 10,680/- With 1300/- Grade Pay. Contenders, interested to apply against District Court Ferozepur recruitment they have to go through the Interview round that will be organized by the recruitment panel of organization. Firstly, approach on web portal of District Court Ferozepur that is http://www.ecourts.gov.in/ferozepur/history. Once the application form filled successfully Contenders should send complete application form to the postal address that is well mentioned below. Closing Date to Submit the Application Form : 06-03-2017. Click Here For District Court Ferozepur Job Notification Link. An employment notification for UPJN Recruitment has been issued by Uttar Pradesh Jal Nigam. Hard working and result oriented Job searchers can submit their applications through online mode for the 383 vacant posts of Routine Clerk, Stenographer before last date which is 28th February 2017. Qualification Required: Aspirants must have 12th / Diploma / Graduation Degree (Computer Science) from well recognized Board/ University/ Institute according to post. Applicants who belong to the category of SC / ST & who are willing to apply they have to submit application processing fee of Rs. 300/-. Age of applying candidates must be between 18 to 40 Years As on 01-08-2016. Contenders who want to join this organization they should be born in between 02-08-1976 to 01-08-1998. Pay Scale: Selected aspirants for Routine Clerk, Stenographer will get the salary pay band of Rs. 5200 - 20,200/- With 1900/- 2800/- Grade Pay. Engagement of aspirants will be based on their performance in Written Exam, Personal Interview that will be driven by the recruitment committee of Uttar Pradesh Jal Nigam. Visit the web portal of organization which is http://www.upjn.org. Opening Date of Online Registration of Application Form Is : 20-12-2016. Online Registration of Application Form Ends On : 28-02-2017. Click Here For UPJN Job Notification Link. Participants can also get latest updates about UPJN Vacancies by bookmarking this page using CTRL+D. Madhya Pradesh State Electronics Development Corporation Ltd has released A newest career advertisement as MPSEDC Recruitment. Organization invites online recruitment application from Capable and Motivated Jobs Hunter to fill up Various positions of Chief General Manager in various trades. Eligibility Criteria: Those candidates are having minimum qualification as Candidates who are willing to apply for MPSEDC jobs must posses Engineering Degree from any recognized board or institution can apply. Monthly Remuneration: Candidates who will be recruited successfully they will get attractive and satisfying salary of Rs. 37,400 - 67,000/- With 8900/- Grade Pay from MPSEDC. Assortment of job finders for above posts will be based on their appearance in Interview which will be conducted by Madhya Pradesh State Electronics Development Corporation Ltd on stipulated date. Visitors have to visit the Official Website to apply for MPSEDC and that is http://www.mpsedc.com. Once the application form filled successfully Jobs Hunter should send it to the Email address stated below before the prescribed time limit along with supporting documents and certificates. Click Here For MPSEDC Job Notification Link. A vacancy advertisement in regard to MAHADISCOM Recruitment has been broadcasted by Maharashtra State Electricity Distribution Company Ltd to inform the Achievement oriented and skilled Participants for the 03 vacant positions of Legal Advisor. Eligible Job seekers can apply for MAHADISCOM vacancy by submitting application form till the last date that is 15th March 2017. Essential Qualification: Those candidates are having minimum qualification as Candidates who are willing to apply for MAHADISCOM jobs must posses Graduation Degree (Law) from any recognized board or institution can apply. Aspirants belonging all Category need to submit application fee of Rs. 600/-. Upper age limit of applicants applying for this recruitment will be 65 Years (Post 1), 63 Years (Post 2). Salary & Pay Band: Applicants who will be appointed against this recruitment they will attain consolidated salary of Rs. 45,900 - 88,800/- (Post 1), Rs. 35,875 - 79,510/- (Post 2) from recruiting organization. A Interview will be conducting by Maharashtra State Electricity Distribution Company Ltd to select candidates for above stated posts. Candidates who want to apply for MAHADISCOM vacancy they are required to go through the official website of organization that is http://www.mahadiscom.in. Click Here For MAHADISCOM Job Notification Link. 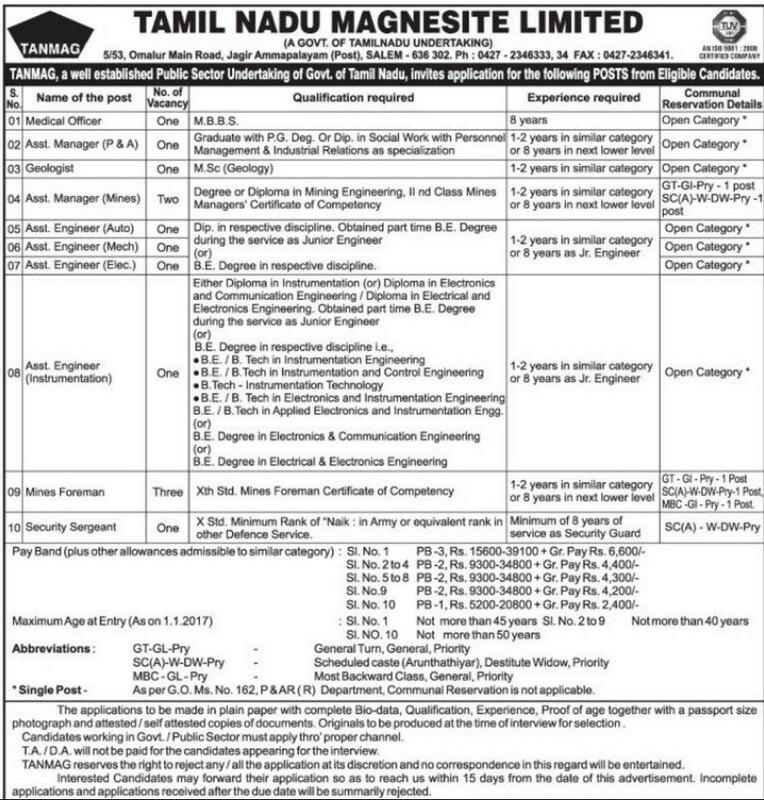 Tamilnadu Magnesite Limited has circulated A job notification regarding TANMAG Recruitment to inform the Hard working and result oriented Jobs Hunter for the 13 posts of Assistant Manager, Mines Foreman. Eligible Contenders can apply for TANMAG vacancy by submitting their applications through offline mode till the closing date that is 8th March 2017. Essential Qualification: Job seekers should have completed the education as 10th / Diploma / Graduation Degree / MBBS with good academic records from well recognized Board/ University/ Institute as per the applied posts. Maximum age limit for the applying candidates is 45 Years (Post 1), 40 Years (Post 2-9), 50 Years (Post 10). Salary & Pay Band: Applicants who will be appointed against this recruitment they will attain consolidated salary of Rs. 15600 - 39100/- With 6600/- Grade Pay (Post 1), Rs. 9300 - 34800/- With 4400/4200/- Grade Pay (Post 2-9), Rs. 5200 - 20800/- With 2400/- Grade Pay (Post 10) from recruiting organization. First of all, aspirants have to visit the web portal of organization that is http://www.tn.gov.in. Last Date to Submit Filled-In Application : 08-03-2017. 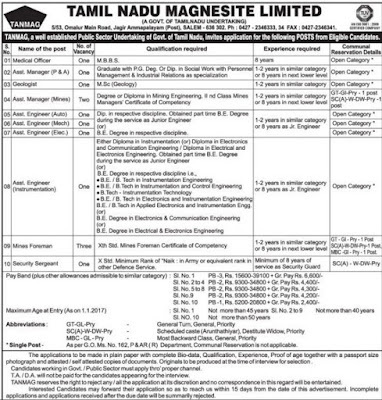 An employment advertisement with name as CUTN Recruitment has been advertised by Central University of Tamil Nadu. Goal oriented and skilled Individuals can apply by submitting application form for the 44 Vacancies of Nurse, Clerk, Multi Tasking Staff before the time limit that is 15th March 2017. Essential Qualification: Job seekers should have completed the education as 10th / 12th / Diploma / Graduation Degree / Post Graduation Degree with good academic records from well recognized Board/ University/ Institute as per the applied posts. Applicants who belong to the category of SC/ST & who are willing to apply they have to submit application processing fee of Rs. 100/-. Applicants who are interested to apply for above mentioned post they should not be exceeding than 57 Years (Post 1), 50 Years (Post 2), 40 Years (Post 3,4), 35 Years (Post 5,6,8-13), 45 Years (Post 7), 30 Years (Post 14-28). Monthly Remuneration: Those applicants who will be recruited successfully against CUTN they will attain salary of Rs. 37,400 - 67,000/- With 10,000/- Grade Pay (Post 1), Rs. 15,600 - 39,100/- With 8000/5400/- Grade Pay (Post 2-4), Rs. 9300 - 34,800/- With 4600/- Grade Pay (Post 5-12), Rs. 5200 - 20,200/- With 2800/1900/1800/- Grade Pay (Post 13-28) from recruiting organization. Contender will be recruited against this recruitment on the basis of their performance in Written Exam, Interview which is about to be conducted by the recruitment committee of organization. First and foremost step you have to take is for opening the official site, which is http://www.cutn.ac.in. Opening Date of Online Submission of Application Form Is : 16-02-2017. Dead Line of Online Application Is : 15-03-2017. Click Here For CUTN Job Notification Link. Jobs Hunter can also get latest updates about CUTN Vacancies by bookmarking this page using CTRL+D. A job notice in regard to JMRCL Recruitment has been broadcasted by Jaipur Metro Rail Corporation Limited. Ambitious, fascinated and proactive Job seekers can submit application form through online mode for the 45 vacant posts of Train Operator, Assistant, Engineer before the end date which is 31st March 2017. Essential Qualification: Those job hunters have done the Graduation Degree / Engineering Degree / National Trade Certificate from a recognized University or Institution may apply. Contenders who are interested to apply for any of the above mentioned positions they should be in between 21 to 38 years (Post 1-7), 18 to 38 years (Post 8,9). What amount I’ll get as pay band? : Successfully recruited applicants for Train Operator, Assistant, Engineer will attain attractive and impressive salary of Rs. 9300 - 34,800/- With 3600/- Grade Pay (Post 1-6), Rs. 5200 - 20,200/- With 2800/2400/- Grade Pay (Post 7-9) from organization. Job searchers who wish to apply for JMRCL Jobs needs to go on official site that is http://www.jaipurmetrorail.in. Starting Date of Online Submission of Application Form Is : 22-02-2017. Last Date To Apply Online Is : 31-03-2017. Click Here For JMRCL Job Notification Link. A vacancy notification in regard to TSCAB Recruitment has been dissipated by Telangana State Co-operative Apex Bank Limited. Ambitious, fascinated and proactive Aspirants can apply by submitting application form for the 96 vacant posts of Staff Assistant, Manager before last date which is 4th March 2017. Qualification Details: Those job hunters have done the Graduation Degree from a recognized University or Institution may apply. Applicants who belong to the category of SC/ST/ PC / EX-S & who are willing to apply they have to submit application processing fee of Rs. 100/-. Age of contenders must be between 20 to 28 Years As On 01-01-2017. Pay Band for Telangana State Co-operative Apex Bank Limited jobs: Appointed aspirants for Staff Assistant, Manager posts will get remunerations of Rs. 11,765 - 31,540/- (Post 1), Rs. 23,700 - 42,020/- (Post 2) which is offered by Telangana State Co-operative Apex Bank Limited. Selection of applying aspirants will be based on their performance in Online Test / Examination, Interview which will be conducted by the recruitment panel. First of all appliers you have to open the official site of the organization that is http://www.tscab.org. Online Application Will Be Received Till : 04-03-2017. Click Here For TSCAB Job Notification Link 1. Click Here For TSCAB Job Notification Link 2. Contestants can also get latest updates about TSCAB Vacancies by bookmarking this page using CTRL+D. Gujarat Cleaner Production Centre is looking for the Achievement oriented and skilled Aspirants to fill up 06 Vacancies of Assistant Project Engineer. Recently, Gujarat Cleaner Production Centre has circulated A vacancy notification regarding GCPC Recruitment. To complete this recruitment process Aspirants who want to grab this jobs opening may attend walk-in interview on 27th February 2017 at the given venue. Qualification: Aspirants must have Engineering Degree / B.Tech (Chemical Engineering) from well recognized Board/ University/ Institute according to post. Pay Band for Gujarat Cleaner Production Centre jobs: Those applicants who will be recruited successfully against GCPC they will attain salary of Rs. 16,000/- from recruiting organisation. First of all appliers you have to open the official site of the organisation that is http://www.gcpcgujarat.org.in. Click Here For GCPC Job Notification Link. A current advertisement with name as Department of Municipal Affairs Recruitment has been issued by Department of Municipal Affairs to inform the Brilliant and qualified Participants for the 07 positions of Clerk, Peon. Eligible Contestants can apply for Department of Municipal Affairs vacancy by submitting their prescribed application form till the closing date that is 14th March 2017. Required Education: Aspirants must have 8th / 10th / Graduation Degree from well recognised Board/ University/ Institute according to post. Salary Structure: Successfully recruited applicants for Clerk, Peon will attain attractive and impressive salary of Rs. 7100 - 37,600/- With 3600/- Grade Pay (Post 1), Rs. 5400 - 25,200/- With 2600/- Grade Pay (Post 2), Rs. 4900 - 16,200/- With 1700/- Grade Pay (Post 3,4) from organisation. Candidates who want to apply for Department of Municipal Affairs vacancy they are required to go through the official website of organisation that is http://www.wbdma.gov.in. Last Date to Submit Filled-In Application : 14-03-2017. Click Here For Department of Municipal Affairs Job Notification Link. Overseas Manpower Corporation Limited is looking for the Goal oriented and skilled Indian Citizens for the engagement of Various positions of Machine Operator. Recently, Overseas Manpower Corporation Limited has dispersed A newest career advertisement regarding Overseas Manpower Corporation Limited Recruitment. To complete this recruitment process Applicants who think themselves eligible for said posts can attend walk in interview on 26th February 2017 at the given venue. Eligibility Criteria: Those candidates are having minimum qualification as Candidates who are willing to apply for Overseas Manpower Corporation Limited jobs must posses 10th / 12th from any recognized board or institution can apply. Age of applying candidates must be between 22 - 26 Years. Salary Details: Those applicants who will be recruited successfully against Overseas Manpower Corporation Limited they will attain salary of Rs. 25,000/- from recruiting organisation. Assortment of job finders for above posts will be based on their appearance in Interview which will be conducted by Overseas Manpower Corporation Limited on stipulated date. Job searchers who wish to apply for Overseas Manpower Corporation Limited Jobs needs to go on official site that is http://www.omcmanpower.com. Date for the Walk In Interview : 26-02-2017. Click Here For Overseas Manpower Corporation Limited Job Notification Link. Women and Child Development Department Korba is looking for the Motivated & dynamic Candidates to fill up 05 Vacancies of Centre Administrator, Case Worker. Recently, Women and Child Development Department Korba has transmitted A latest career related advertisement with name as Women and Child Development Department Korba Recruitment. To complete this recruitment process Participants who want to grab this jobs opening may attend walk-in interview on 25th February 2017 at the given venue. Qualification Details: Those candidates are having minimum qualification as Candidates who are willing to apply for Women and Child Development Department Korba jobs must posses Graduation Degree / Post Graduation Degree from any recognised board or institution can apply. Applicants who are interested to apply for above mentioned post they should not be exceeding than 55 Years (Post 1), 45 Years (Post 2). Salary Package: Shortlisted aspirants for Centre Administrator, Case Worker will receive pay scale of Rs. 25,000/- (Post 1), Rs. 15,000/- (Post 2) which is offered by Women and Child Development Department Korba. Contenders will be hired against this recruitment on the basis of their performance in Interview that will be conducted by selection committee of recruiting organisation. First and foremost step you have to take is for opening the official site, which is http://www.korba.gov.in. This will open a list of the links having latest openings and candidates have to select the most appropriate link which will open the complete advertisement having further details regarding Women and Child Development Department Korba Vacancies. Date for the Walk In Interview : 25-02-2017. Click Here For Women and Child Development Department Korba Job Notification Link. Job searchers can also get latest updates about Women and Child Development Department Korba Vacancies by bookmarking this page using CTRL+D.